Daily Mirror - What’s behind UNP’s lost Paradise What does mandate mean? Councils or votes? What’s behind UNP’s lost Paradise What does mandate mean? Councils or votes? After the Mahinda Rajapaksa loyalists under a new title, Sri Lanka Podujana Peramuna (SLPP) winning the highest number of seats in the majority of Local Government bodies, people with various affiliations are heard making various comments analysing the results of last Saturday’s Local Government elections. According to the winning SLPP President Maithripala Sirisena and Prime Minister, Ranil Wickremesinghe do not have moral right to continue with their administration and therefore they must dissolve Parliament allowing the people to elect a new Government. Finance Minister Mangala Samaraweera opines that the collective achievement by those against the SLPP is larger than that of the SLPP. That is true not only at the national level but also at the local level in many areas. When it comes to people’s mandate the SLPP had bagged only about 45 percent of votes while the other non-SLPP parties and groups obviously had obtained the balance 55 percent. In many local councils, the winning parties such as the SLPP, Thamil Arasu Katchi (ITAK), Sri Lanka Muslim Congress (SLMC) and the Ceylon Workers Congress (CWC) have not obtained an absolute majority and are seeking the support of other parties to institute the council administrations. However, the argument by Minister Rajitha Senaratne, who said that the Yahapalana Government has become stronger than before, after the elections could be explained only by him. Anura Kumara Dissanayake, the leader of the Janatha Vimukthi Peramuna (JVP) attributes the defeat of the ruling United National Party (UNP) and the Sri Lanka Freedom Party (SLFP) to their failure to take action against the corruption by the leaders of the previous regime. "Also, the two ruling parties -UNP and the SLFP- that had collectively received more votes and represent a higher percentage than what the SLPP had achieved are in a position to run only 51 councils whereas the SLPP dominates in 239 councils." It is clear that he did not mean that the people who had been frustrated by the absence of action against the leaders of the former Government had voted for the very same leaders. His argument was that the UNP and the SLFP have frustrated a segment of their own supporters to refrain from going to the polling booth. The best example of the people being self-centred in their analysis of election results was the university students who had stated that the people’s verdict was nothing but one against the Government’s pro-SAITM policy. It is ludicrous to say that at least a hundred thousand out of little more than 10 million people who had used their franchise in these elections had voted against the government due to its SAITM policy. In another similar statement the Educational Secretary of the Frontline Socialist Party (FSP), Pubudu Jagoda had said that the vote cast for the Pohottuwa (lotus bud) was not a vote for Mahinda Rajapaksa but one for a change in the Government. It is obvious that those who voted for Pohottuwa are for a change of the Government, but they were with the former President even during the last Presidential election. It is childish unless hypocritical to deny the role played by the Rajapaksa factor in Saturday’s election. Many people including the Chairman of the Elections Commission, Mahinda Deshapriya had now suggested a review of the new electoral system that was put into practice for the first time at the just concluded elections. Such a review is important when one compares especially the number of votes each party had secured with the number of councils they are going to rule. Despite the Elections Chief claiming that the new system represents the Proportional Representation to the letter, the system has painted a distorted picture in respect of the number of councils each party has won. "They showed that they were not on the ground in the very first month after they came to power by taking action to reduce the price of plain-tea and hoppers, as a measure of bringing down the cost of living. " For instance, while the SLPP which had obtained 4,941,952 or 44.65 percent of votes by Monday is to control 239 councils, the UNP with its 3,612,259 votes representing 32.63 percent of the constituency had secured only 41 councils, not even half of the councils the former had captured. Also, the two ruling parties -UNP and the SLFP- that had collectively received more votes and represent a higher percentage than what the SLPP had achieved are in a position to run only 51 councils whereas the SLPP dominates in 239 councils. The statement by Mr Deshapriya is valid in respect of the ratio between the votes and seats that each party had obtained. But in the public eye, it is the number of councils that matters and hence the present political crisis in the country. The demand by the leaders of the SLPP for the government to resign on the grounds that it had lost the people’s mandate it received at the Parliamentary elections in 2015 is incomprehensible as the collective achievement of the two ruling parties alone indicates otherwise. The UNP and the SLFP/UPFA had received by Monday 5,093,915 votes whereas the number with the SLPP was 4,941,952. The mandate does not mean the number of councils a party can control, rather it signifies the people who had used their franchise in favour of a party. However, on this line of argument, UNP alone does not have the mandate to rule the country. Government Ministers claim that the votes cast in the name of Mahinda Rajapaksa had reduced this time compared with the last Presidential and Parliamentary elections. 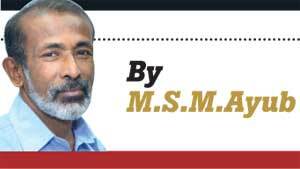 True, the percentage of votes received by the Mahinda loyalists this time was less than what they had achieved at the Presidential Election,but not at the Parliamentary Election. Nevertheless, the former President’s group had increased its vote bank by about two hundred thousand compared to the last Parliamentary elections. In the meantime, the drop in votes polled by the UNP and its percentage was drastic and humiliating, in spite of the two ruling parties as a combination having fared well compared to the main rival SLPP. What is more important is that UNP leaders are still clueless as to what went wrong within their vote bank. The “no action, talk only” policy followed by the UNP seems to be the main reason for its setback. As the JVP leader claims, the hollow rhetoric against the corruption committed by the leaders of the former regime might have distanced a section of the voters from the UNP but have not sided with the Mahinda group either. The frustration of the voters who voted for the UNP at the last Presidential and Parliamentary elections in this regard might have deepened by the accusation by President Maithripala Sirisena that the UNP has been delaying and stalling the investigations against the former leaders. A large segment of educated society teamed up with the UNP and the anti-Rajapaksa group at the last major elections, with the hope of eradicating corruption and bringing in good governance. The UNP totally disappointed them by attempting to cover-up the Central Bank bond scam and to defend the culprits in that massive fraud. With the corruption during the last regime being fresh in their minds, these voters might have had no option but to vote either for the JVP or the SLFP or to abstain from voting. One cannot ignore Minister Palani Digambaram saying that statements made by his opponents that the monies deposited in the Employees Provident Fund (EPF) had been plundered by those involved in the Bond Scam had seriously affected the UNP vote bank in the plantation areas. UNP’s dismal failure in sensing the pulse of the people is another serious issue for the party. They showed that they were not on the ground in the very first month after they came to power by taking action to reduce the price of plain-tea and hoppers, as a measure of bringing down the cost of living. This was a very good indication that they did not know what is essential for the people. They promised to create one million employment opportunities in five years and recently claimed that 400,000 jobs had been given to youth during the past three years, without initiating a single factory or any other workplace during their tenure. Policies do not matter in elections in a big way, but the actions that directly affect the people would do.